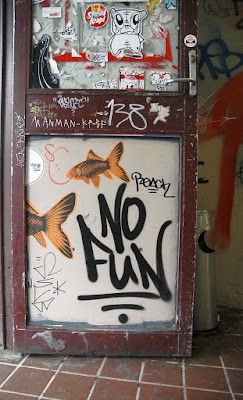 Above 49: Say No to "Fun"
Seriously folks, we need to stop talking about "fun." Or at least talk about it less. I've made this comment in various locales, but I thought given the resurgence of the topic, it would be good to put my stake in the ground here. I think we should stop saying games should be "fun" when we really mean games should be "engaging." This is the example I usually come back to, but there are plenty of films that I wouldn't call "fun," but I still enjoyed watching them. Requiem For A Dream isn't a fun film. Not in any way. Certainly not like Drag Me to Hell is fun. But Requiem is still very much a rewarding experience, because it's engaging. Similarly, is listening to Tom Waits' The Black Rider really fun? That seems ... inaccurate. Now is Movits! and their mad Svenska jazz/hip-hop fun? Without a doubt. The Path, at least to me, is an instance of a game that's engaging but not necessarily fun. It's dark, slowly paced and obtuse in a Lynch-esque way. But I certainly didn't feel my time playing it was wasted or feel I didn't get anything from the experience. I've got lots of respect for Raph and his book, but wow, I wish he wouldn't have said "fun." Because the satisfaction that he describes arising from discovering, internalizing and utilizing systems is equally valid if we label it as "engaging." Fun has a lot of contextual baggage. As game designers, we can converse about "fun" and have a relatively decent chance of people understanding we mean Koster's fun, not ice cream, cake and clowns fun (okay, maybe clowns aren't fun for anyone). But many players, and nearly everyone that's not a core gamer, does not think of Koster's definition when they hear "fun." Their perception is largely that fun is a quality of shallow amusements, of toys. And while that's fine, Candyland isn't going to show up in the MoMA any time soon. Speaking in terms of engagement is going to make conversing with two groups of people easier. One is the existing gamers that Anthony Birch addressed in his rant. While I'm sure some of these people are genuinely believe it's an anathema for games to be anything but shallow, escapist stab-fests, I don't think all of them do. I imagine when some of those people say, "games have to be fun" they really mean "games have to be engaging." But more importantly, speaking from "engagement" will make the conversation with potential players who aren't core gamers easier. It's great that Nintendo has brought more folks into the fold via the DS and Wii. But to be honest, many of their core games are not exactly rich in emotional depth. Wii Sports Resort and Mario Kart don't exactly speak to the human condition. I don't think the Wii Horse Bag is going to change that. Again, Nintendo's games are absolutely fine. They do not have an obligation to make more emotionally deep games. But for non-core gamers, their only experience with games is as "fun" things. Being able to say those are one kind of thing and here's another kind that are similarly interesting but won't make you smile like Frisbee Dog will be increasing important. This subject was broached in a local design group I'm part of and one of the folks there works in more of the serious/health games space. He related that he frequently speaks with non-gamers (e.g. academia, non-profits, health companies, etc.) and he's had vastly more success when he comes at the conversation from "engagement" instead of "fun," even though he means Koster's fun when he says "engaging." It nothing more than a verbal texture swap, but without all the context baggage many have about what "fun" is, he's able to have a far more productive and useful conversation. I don't think his experience is unique. Believe me, most games will still be fun (like mini-golf and milkshakes fun). But it's going to make the discussion about how to make and why one should play more emotive games vastly easier if we can sidestep the "what kind of fun" quagmire completely. Ultimately, this isn't about us. We're already on board. We get what we mean when we say "fun." Speaking from "engaging" is about helping other potential advocates (or at least audiences) understand why we see so much potential in what we do. And at the end of the day, that's what really matters. It's nice to hear that others share the same viewpoint on "fun" and "engaging" as I. I even made a post about it on my blog a while back: http://mullingoverthemultiverse.blogspot.com/2009/07/why-goal-should-be-not-just.html (I also posted it on Gamasutra's member blogs). We even both use Reqiuem of a Dream as an example of an engaging, but important, work, uncannily. When I posted it on Gamasutra, I even got a comment or two from others who had discussed "fun" and "engaging" as well in previous posts of their own. I hadn't been on Gamasutra in a while, so we all seem to have developed our ideas independently. I guess the point of my rant of a comment is to point out that many people are starting to share the idea of the difference between "fun" and "engaging". I'm glad to see this is an idea that many people have come to. Keep up the good posts. I'm sorry I have to disagree... or at least allow me to play devil's advocate for the sake of discussion. While I understand the word "fun" is extremely subjective and difficult to define, I'm afraid the word "engaging" doesn't help (for me) much either. A virtual reality session or simulator can be very engaging without being fun. Perhaps it's a mandatory training course that puts the "player" in a 3D world and they truly feel immersed in the atmosphere but are still bored to tears. At the risk of my own failed definition, a better E-word I think would be "enjoyment". Can the player walk away saying they enjoyed the experience or that they were (at least briefly at some point) entertained? That's just my two cents. I enjoyed reading your post and appreciate the opportunity to leave feedback. Thanks! Ah, but using the word "enjoyment" neglects works that are not really enjoyable, but still important and engaging. Requiem for a Dream, for example, would not be called an enjoyable film by most (at least not by me). Even so, I think many would agree (or at least I do) that it is a worthwhile, engaging film, and it is worthy of a watch. Or that's how I see it. I just think enjoyment is too close to fun while engaging encapsulates both fun and things that may not be fun, but still worthwhile. @JPLC Nice post, definitely good to see more folks rallying around this. @JW I appreciate the situation you're present, but I'd say that boredom and engagement are mutually exclusive. Maybe you're "experiencing" a boring simulation, but it's not engaging unless it's worthwhile. On a higher level, I don't think we'll ever find a perfect term. But I think engaging is closer than fun, and past the mark of "good enough." It's really just that fun has too much of baggage (especially for non-gamers) to be useful, just about anything else should be sufficient. This is neither here nor there, but it's always bothered me that it's so hard to invent words these days. We have a (reasonably) clear definition. Now, we just need a word to map it to! I remember the first time I played the original Fallout. I was in Junktown and got into an argument with a guard. To cut a long story short I ended up slaughtering most of the town. I personally wouldn't have describe the experience as fun or even cathartic but it was engaging. Like something out of a Cormac McCarthy novel. @Graham My captcha is pallam. I don't think it really has much of a ring to it. @Graham It's getting a reasonable mass of people to use the new word that's the tricky part. Clint managed to pull it off, more or less, with "ludonarrative dissonance" but it's not an easy act to repeat. For good or ill, we love to reinvent in the game industry, but it tools, engines or even terms.